As we travel around this wonderful planet we call Earth, it’s not difficult to compose what many call a ‘bucket’ or ‘must do’ list. These, as their names suggest, tend to comprise all those places to visit and activities to achieve before we’re either too old to accomplish them, or indeed, we slip off the hook permanently. Some of these are major undertakings, such as visiting the Great Wall of China, or getting as close as one can to the North Pole, while others, although more sedate and less sensational, can take an equally valid and respectable place on the best of lists. One such adventure is the relatively simple enterprise of travelling the whole length- yes, all 68 kilometres (42 miles) – of the Belgian Coastal Tramway, or Kusttram, as it’s known locally. Operated by the De Lijn transport network, and with a fleet of relatively modern HermeLijn tramcars with low platforms for accessibility, the tramway is both the longest, and only remaining interurban, line in the world, connecting passengers between cities. Running all the way from De Panne, at the French border, to Knokke on the Dutch frontier, this heavily used service connects all the resorts, towns and cities on the West Flanders coast, and is a satisfying journey to undertake. 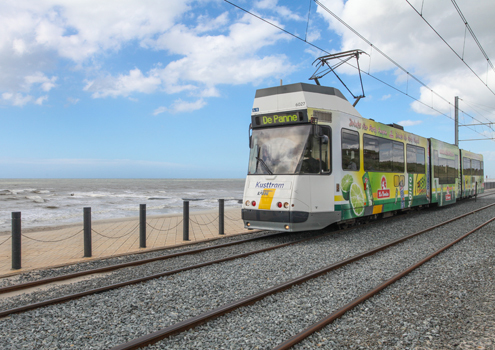 Unlike the world famous Blackpool to Fleetwood Tramway in the UK, upgraded at massive cost to reopen in 2012 with sparkling new Bombardier Flexity cars, the Belgian line actually runs along the beach for just a short few kilometres west of Ostend. Although close to the shoreline for most of the journey, it is tucked a few hundred metres inland, so don’t expect a view of the sea for much of the route. Taking around two and a half hours terminus to terminus, don’t forget that, unless you’re literally departing from De Panne bound for an eventual stay in Knokke, or vice versa, you’ll need to double that time for a start and return from any other point on the route, so if you’re going to do any exploring, you’ll need to allow plenty of time. If you have a few days to spare, it’s well worth getting a one, three, five or seven day pass, the useful three dayer coming in at just 10€ per person when bought in advance (12€ on the tram). It would obviously take quite some time to explore the whole of the coast, so it might be sensible to base yourself in Ostend, and do the trip in stages. Trams run every fifteen minutes or so throughout the summer season, so you can literally hop on and hop off as you please. Noteworthy disembarkation points are the beautifully Victorian resort of De Haan, kiss-me-quick Blankenberge, and Zeebrugge if time is limited; you can always add in more of your choice if your schedule permits. One of the points of interest along the 70 stop length of track is the two alternative routes slightly east of Zeebrugge, and a similar diversion around the inland end of the Boudewijnkanaal lock, avoiding delays to the tram schedule when the road bridge that the tram line normally follows is raised for passing boats. A similar arrangement is in place south of Ostend Train Station, around the entrance to the Vlotdok lock. A good one to tick off your list, particularly if you love Belgium as much as we do, the Kusttram is an enjoyable and fairly easily accomplished summer adventure, suiting fans of the more traditional beach holiday, tram enthusiasts and completists in one fell swoop. 5 wacky modes of European transport – discover your destination in style!